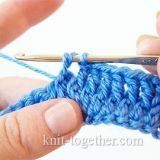 This dense crochet pattern stretches in length very well and badly - in width. 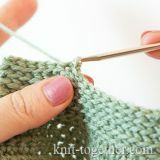 You can use it to crochet details both in length and width. In either case, you can get a beautiful texture. 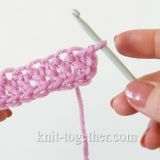 This pattern is can be using for crochet any things: from mittens, hats and socks to jackets and dresses. The pattern blends well with decorative patterns and crochet flowers. Sides of the pattern look different. Pick a face that you like. 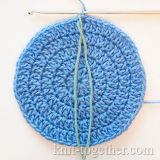 For swatch make chain stitches a multiple of 2, plus 2 turning chains. 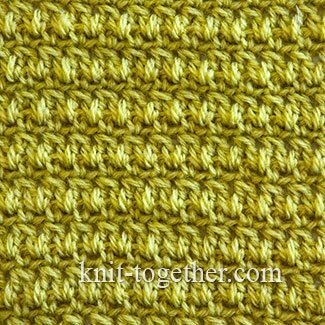 The rapport of the pattern in width - 2 stitches, in height - 2 row. 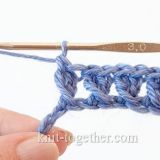 3 row: 2 chains, * 1 single crochet in top of two double crochet stitches, 1 chain, skip 1 stitch of previous row *, 1 single crochet in last stitch of previous row. Then the pattern repeat from 2nd row.